I bought a canon sx120IS, and these are my first impressions about the camera. It certainly doesn't look all that glossy and stylish like a Sony. It is priced at roughly Rs 15995 but it cost me about Rs 15k which did not seem too much for a 10x optical zoom, 10 mega pixel camera. 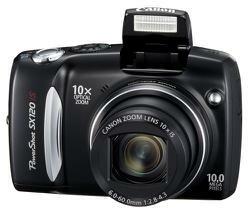 The camera is quiet compact compared to other 10x optical zoom camera's out there which are bulky. Unlike other camera like sony which is powered by lithium ion cell batteries, the Canon sx120IS operates on two AA Batteries which is a good thing because you don't have to carry around too much batteries and these types are cheaply available almost in any part of the country. The camera comes along with 2 non rechargable batteries but you can get a couple of rechargeable alkaline batteries for < Rs.450 ($10) and a charger for the batteries. The memory card that was bundled along was of 2 GB and a 128 MB card, ( a mother and daughter card ? ;) ) anyway which is decent enough to take around 740 photos at 10 mega pixel in fine grain quality. The image quality is pretty good on Canon SX120. Although when you see the preview on the LCD before taking is slightly grainy, the photos are pretty good. The image quality seem to go down a bit when you zoom too much. You can set the aperture open time from 1/250th of a second to 15 seconds. There is no view finder or a small rectangle through which you can look through, but you got a big LCD screen to see what you are focusing. It does not weigh too much.